On June 30, Allentown, PA-based Air Products and Chemicals, Inc. successfully captured and transported, via pipeline, its 3 millionth metric ton of carbon dioxide (CO2) to be used for enhanced oil recovery. This achievement highlights the ongoing success of a carbon capture and storage (CCS) project sponsored by the U.S. Department of Energy (DOE) and managed by the National Energy Technology Laboratory (NETL). The project demonstrates how a gas separation technology called vacuum swing adsorption can be implemented into an operating facility. The technology is being used at a hydrogen production facility in Port Arthur, Texas, to capture more than 90 percent of the CO2 from the product streams of two commercial-scale steam methane reformers, preventing its release into the atmosphere. In addition to demonstrating the integration of Air Products’ vacuum swing adsorption technology, the project is also helping to verify that CO2-enhanced oil recovery (CO2-EOR) is an effective method for permanently storing CO2. CO2-EOR allows CO2 to be stored safely and permanently in geologic formations, while increasing oil production from fields once thought to be exhausted. The CO2 captured from the Port Arthur facility is being used for EOR at the West Hastings Unit (oilfield) in southeast Texas. Injected CO2 is able to dissolve and displace oil residue that is trapped in rock pores. It is estimated that the West Hastings Unit could produce between 60 and 90 million additional barrels of oil using CO2 injection. In total, projects sponsored by the U.S. Department of Energy have captured and securely stored more than 12 million metric tons of CO2, equivalent to taking more than 2 million cars off the road for a year. Investing in projects and technologies, such as Air Products’, are critical to paving the way for more widespread use of CCS technologies. Deep in the solidified lava beneath Iceland, scientists have managed an unprecedented feat: They’ve taken carbon dioxide released by a power plant and turned it into rock, and at a rate much faster than laboratory tests predicted. The findings, described in the journal Science, demonstrate a powerful method of carbon storage that could reduce some of the human-caused greenhouse gas emissions contributing to climate change. The pilot programme, performed at Reykjavik Energy’s geothermal power plant under a European-US programme called CarbFix, was able to turn more than 95 per cent of carbon dioxide injected into the earth into chalky rock within just two years. When fossil fuels like coal or gas are burned, the carbon stored within them is released into the air in the form of carbon dioxide. This greenhouse gas traps heat in the atmosphere, triggering an increase in global temperatures that threatens polar ice reserves and contributes to rising sea levels. It also increases the acidity of the ocean, hastening the decline of corals and other marine life. Researchers have tried for years to figure out how to get that carbon back into the ground. Carbon dioxide can be pulled out of emissions and injected underground into briny waters or emptied oil and gas reservoirs, but there’s a risk that the gas eventually would seep back into the air or that the injection process itself might crack open a reservoir and allow its contents to escape. Researchers have been looking to get that carbon back into the ground in solid form — something that nature’s been doing for a while, although on a far longer timescale. For humans trying to quickly undo the damage of greenhouse gas emissions, that’s easier said than done. Sandstone does not react much with carbon dioxide. Some lab tests showed that basaltic rock, laid down by volcanic activity, might be more effective but on a scale of centuries, if not longer. An opportunity for a field test arose when the president of Iceland, Olafur Ragnar Grimsson, met researchers at Columbia and expressed his interest in cutting back the country’s carbon dioxide emissions. “This is really the start of this, at the highest level, which is sort of unusual for research projects,” Stute said. The researchers separate the carbon dioxide from the steam produced by the plant and send it to an injection well. The carbon dioxide gets pumped down a pipe that’s actually inside another pipe filled with water from a nearby lake. Hundreds of metres below the ground, the carbon dioxide is released into the water, where the pressure is so high that it quickly dissolves, instead of bubbling up and out. That mix of water and dissolved carbon dioxide, which becomes very acidic, gets sent deeper into a layer of basaltic rock, where it starts leaching out minerals like calcium, magnesium and iron. The components in the mixture eventually recombine and begin to mineralize into carbonate rocks. The basaltic rock is key, the scientists said: Sandstone would not react with carbon dioxide this way. So is the presence of water; if the mix had been pure gas instead of gas dissolved in water, it’s unlikely the basalt would have helped form carbonate rocks — at least, not with such speed. The scientists also injected chemical tracers into the mix, including a type of carbon dioxide made with the heavier, rarer isotope known as carbon-14. They also injected other trace gases such as sulfur hexafluoride, which is inert and does not react much with its surroundings. When the researchers checked the water at monitoring wells later in the experiment, they found that the trace gases were still there (a sign that the water had gotten through) but that the proportion of carbon-14 molecules had significantly declined. As the water had continued to flow through the basaltic layers, the carbon dioxide had been left behind in the rock. While much of this happened underground, the researchers also saw fine crystals of carbonate sticking to the surface of the pump and pipes at the monitoring well. “They look like salt from a salt shaker … on the surface of this gray or black basaltic rock,” Stute said. Based on other laboratory results, the scientists had expected the process to take centuries, if not longer. But the field test showed that this process, under the right conditions, happens at remarkable speed. China’s long-awaited nationwide carbon market will cover as many as 10,000 firms and regulate nearly half of the country’s total emissions once launched in 2017, a senior official said on the sidelines of the Paris climate talks yesterday. 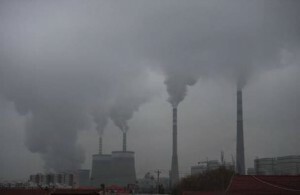 Jiang Zhaoli, vice-head of the climate office of the state planning agency, the National Development and Reform Commission, said China’s carbon market would become the world’s biggest, and its targets would be higher than those set by the state “in order to guarantee it had sufficient effect”. The market would cover 31 provinces, six industrial sectors and 15 sub-industries, and would involve 4 billion tonnes of annual carbon emissions at its launch, amounting to almost half of the country’s total, he said. President Xi Jinping pledged during his visit to the United States in September that China would roll out a nationwide carbon trading scheme by 2017, building on the seven regional pilot markets first introduced in 2013. Jiang’s comments suggest the market will begin more ambitiously than expected. Previous estimates from market designers suggested it would regulate 3-4 billion tonnes of carbon dioxide a year by the end of its first phase in 2020. While China has included the promotion of “market mechanisms” in its pledges to combat climate change, they remain controversial and were unlikely to be included in a final agreement in Paris, said Su Wei, China’s top climate negotiator, at a briefing in Paris on Saturday. “As far as market mechanisms are concerned, we think the market could play a very important role in achieving actions to mitigate and adapt to the impact of climate change,” he said. “But as to whether there is going to be inclusion in the text of the Paris agreement, we think that that is not the priority,” Su said. China’s central government pledged last year to peak carbon output by around 2030, reduce dependence on fossil fuels, and offer help to poor countries adapting to the impact of global warming.